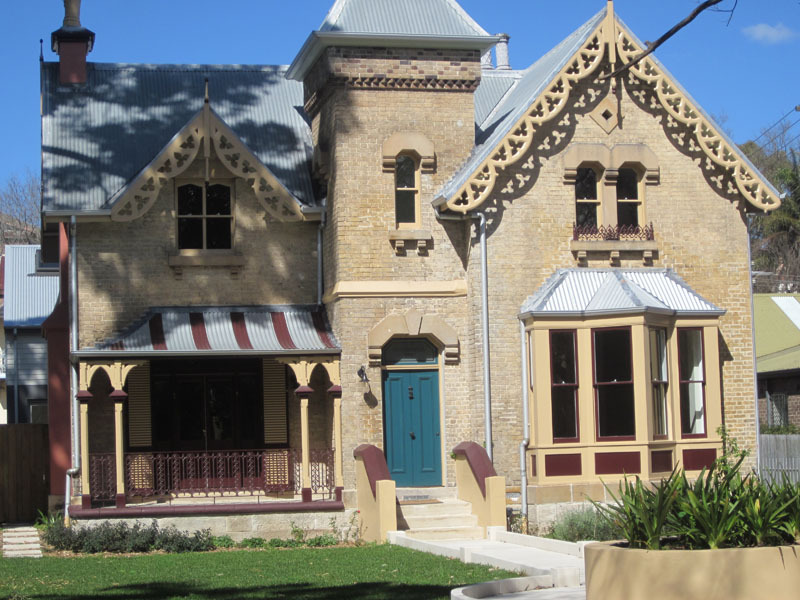 Bridge Road was the grandest street in Glebe in mid-Victorian times and the Abbey site remains among its most beautiful. Reussdale (c 1868) is one of a number of houses in Bridge Road built by Ferdinand Reuss Jnr from the early 1860s and is an outstanding example of the Picturesque Gothic style. Reuss’s father, who had emigrated from Germany to the US, had worked on the Erie Canal, the great artery that opened the Hudson River, and hence New York, to the Great Lakes and the burgeoning Midwest. The house possesses several unusual features such as the treatment of the walls. The back and side walls are rendered – the normal treatment of walls at this time. 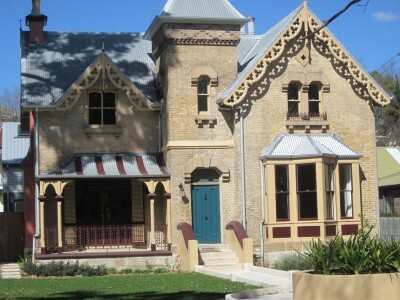 But the front of the house is of exposed, apricot-brown brickwork, speckled with crushed coke, and the unusual bay window features a triangular pointed frame unique in Glebe. There are three extant dwellings by Reuss in Bridge Road – Reussdale, The Hermitage and 177 on the other side of Bridge Road. (A fourth, his first cottage,Hamilton, is to be reconstructed as part of the redevelopment of The Abbey site). Each is very different and reflects Reuss’s versatility as an architect. Reussdale served as the manse and Hamilton as the church hall. Reussdale was renovated in 2010 after lying derelict for thirty years. The Abbey (Thomas Rowe, 1876) itself stands on the site of yet another Reuss building that was demolished when the church was moved, stone by stone, from the corner of Glebe Point Road and Broadway in 1927. Walk east, and next to The Abbey site behind a stone wall is The Hermitage (1866), like Reussdale itself set well back amid gardens, but with elaborate bay windows and cast iron balconies. Cross the pedestrian crossing to Woolley Street. Note the many large houses lining Bridge Road at this point. In Reuss’s day this was the wealthiest and most splendid street in Glebe. Further along Woolley Street (named after a Chancellor of the University of Sydney) is St James’ Church (1870). The original nave was extended forward by a bay in 1912, which explains the purple face bricks and yellow tiles. If the church is open inspect the interior, especially the stained glass windows, which show a strong pre-Raphaelite influence. Bernard and Kate Smith, The Architectural Character of Glebe, University Co-operative Bookshop, Sydney (1973), pp54-55.